The Provost Church, originally dedicated to Saint Leonard of Limoges, is sited at the highest point of the inhabited area on sharply sloping land. It was built in the second half of the thirteenth century, at a time when the Commune of Monticchiello was expanding (well over 1,000 inhabitants, as opposed to today’s 300). Its architecture represents a transition between Romanesque and Gothic. The plan of the church is T-shaped, facing almost exactly east, with a rectangular apse flanked by two similarly-shaped chapels. This is a typical design of Burgundy-style Romanesque-Gothic as introduced into Italy by the Cistercian order of monks. The well-preserved exterior of the building presents high walls carefully constructed of squared-off blocks of local sandstone, with very little decoration. Along the sides of the nave there are six tall round-topped windows, of which only two are open. The transept is pierced with seven windows, similar to those on the nave but smaller, apart from the large window on the choir which has a pointed arch. At the left-hand corner of the transept a subsidiary door was created with a semi-circular arch; but this was filled in quite soon after it was opened, no doubt to maintain the wall’s stability. Another narrower door on the same side is open and in use. The most decorated part of the church is its façade. The main door is surrounded by pilasters and slim columns, which above their capitals curve into a low arch, above which there is an acute-angled cusp. Further up, separated off by a horizontal frame carved with two rows of leaves, there is a magnificent rose window subdivided by small trilobated columns. The interior of the church feels quite different, having been re-structured in the eighteenth century. 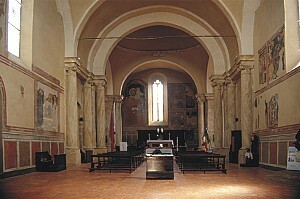 The walls were whitewashed, covering over numerous fresco paintings of the fourteenth-century Sienese school; and some windows were blocked to make space for some unimpressive stucco altars. The interior space was divided by composite columns supporting slim vaults of quartz, which altered the spatial proportions and hid the original carved roof beams. This masterpiece of bad taste was carried out in the second half of the eighteenth century, and finished off in 1797 with the building of an enormous alabaster altar. The artistic importance of this church led to its restoration in 1933 by the Superintendency for Tuscan Monuments, which stripped it of some of its Baroque additions. Although this restoration was incomplete, it gave a new character to the interior. Five Baroque altars were demolished, and three sandstone altars were re-established against the internal wall. 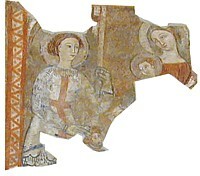 The whitewash was chipped away, revealing some wonderful frescoes, some of them complete and others only fragmentary. Five windows were re-opened, the sacristy area and the two side chapels were restored. However, insufficient funds meant that the restoration was unfnished: the vaults which rest on the ten huge columns still block the four windows in the nave.